The wonderful wizard of pause? Ugh, forget I typed that. As NEStalgia week got rolling, I knew that at some point I was going to watch The Wizard. It’s the only movie that’s really about Nintendo games, as opposed to being based off of one. It is unapologetic in being a commercial for the NES, for instance, some of it’s titles abroad include; Joy Stick Heroes in Germany, Game Over in Finland, and the straight-forward Video Game Genius, Videokid and Gameboy in Brazil, France and Sweeden, respectively. Only Japan joins the US in playing it non-literal with the title Sweet Road, which is bitterly ironic considering all the torture the kids in the movie go through on their journey. 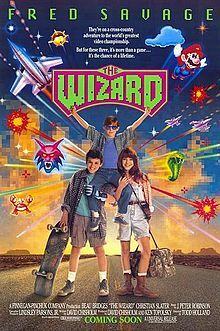 Few things have ever served the dual purpose of epitomizing a moment in time and advertising a product as well as The Wizard, and no walk down NES memory lane would be complete without a viewing. My memories of it are fond, but I didn’t expect it to be a great movie. Well, I suppose all things considered, it’s not, but I did thoroughly enjoy watching it again, and unexpectedly, it reminded me that as much as life moves forward, everything always comes full circle. First things first, if you haven’t seen The Wizard, it’s available in it’s entirety on youtube. To sum up, Fred Savage plays Corey, half brother to a younger kid named Jimmy who was traumatized a couple years earlier by the drowning of his twin sister. Jimmy lives with his mom now, while Fred Savage and Christian Slater live with their dad (Beau Bridges), the family having fallen apart after the drowning. Jimmy doesn’t say much, except for the word “California”, but he does keep trying to walk there. His mom and step father decide to “put him in a home” to use the only phrase the movie ever employs in describing Jimmy’s treatment. Fred Savage is outraged by this but unsuccessful in convincing Beau and Christian to take action, so he decides to break Jimmy out on his own and run away together and take a trip. When he gets to “the home” and suggests this to Jimmy, his little brother’s only response is “California?”. And so they have a destination. One time and one time only did The Wizard miss such a ripe opportunity for product placement. Along the way, Fred Savage notices Jimmy has mad Double Dragon skills. They also meet the plucky young Haley (Jenny Lewis!! ), who, after being hustled by Fred Savage and Jimmy, suggests they go to Video Armageddon in California and try to win the $50,000 prize. She promises to help get them there for half the money. So they all set off together. 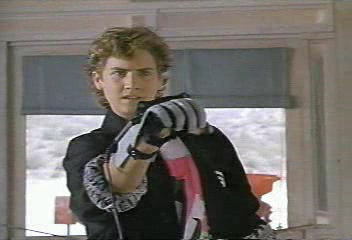 Along the way, they find Jimmy a rival- the infamous Power Glove toting Lucas Barton. They also manage to get robbed a couple times, and to get Fred Savage beaten up by some kids he and Jimmy hustled. Meanwhile, in the finest NES racing game fashion, they are pursued by two players; PLAYER1 is the two headed monster of Beau Bridges and Christian Slater, a father and son duo who were doing some serious fighting at the beginning of the movie. Beau is initially determined to go after the boys alone in spite of Christian Slater’s insistence, until they are comfronted by PLAYER2, the excessively sleazy Putnam, a bounty hunter who goes after children, and who promises to bring back Jimmy and only Jimmy, and insinuates consequences if anyone gets in the way of his bounty. Next to Lucas Barton’s presidential nuclear football style case for his Power Glove, the idea that anyone would allow Putnam to have anything to do with their children is the least believable thing about this movie. Well, hardships aside, the rest pretty much writes itself. Beau Bridges and Christian Slater learn to love each other AND Nintendo games during their trip together in pursuit of the runaway boys. Sleazeball Putnam almost nabs Jimmy a couple times, but is thwarted by the plucky young Haley and some of her trucker friends. In contrast to his being hired to safely return a child standing as the movie’s least believable plot point, his being arrested and drug out of a casino accused of molesting one stands as the movie’s most believeable scene. Fred Savage and Haley develop a pseudo-romance. And Jimmy beats Lucas Barton and wins Video Armageddon! He then finally finds “California”, which turns out to be the Cabazon Dinosaurs, where the family had once road tripped together when his sister was still alive. He sets down his lunch pail of memories of her, and Jimmy leaves with Beau, Christian, Fred and Jenny Lewis. Now, they have enough money to do what they had planned all along. Oh, wait, they never said what they were going to do with the money. I really think this is the only movie I’ve ever seen where the main story arc was going to win a big lump of money and that money wasn’t even intended for any purpose. Video Armageddon is not a means to an end in The Wizard, it IS the end. The main message of the film is that Nintendo games are awesome, and in this message, it is successful beyond belief. Super Mario Bros. 3 is one of the best selling games ever in North America, and it exploded onto the scene fueled by the hype and anticipation kids had after watching Jimmy play it in the film’s climactic sequence. Every major character in this movie who is not a slimeball loves and plays Nintendo by the end of it. 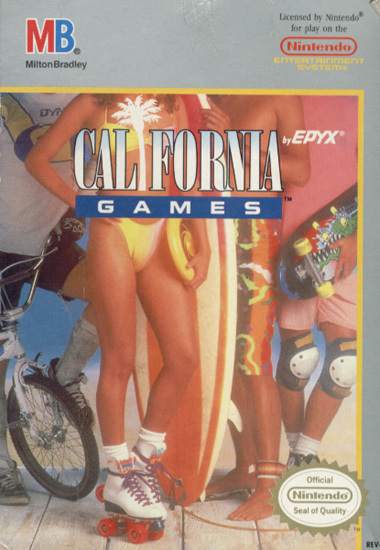 It was unanimously panned by critics at the time of it’s release- Roger Ebert amongst others dismissed it as being a thinly veiled commercial for Nintendo products. I didn’t have a problem with it as a kid because NINTENDO IS AWESOME was the level of my thinking then. I don’t have a problem with it now because not only is Nintendo still awesome, well, the veil just doesn’t seem that thin. There is nothing about this movie that doesn’t claim to be anything but an ode to the NES and it’s games and peripherals. Some of the products it advertised were more successful than others, of course. It is exactly what you would expect overall, very much a cheesy 80’s movie that at this point can be enjoyed both nostalgically, and also for it’s unintentional humor. But for me, the journey was ever so slightly more personal, and watching it again, I realized a couple things. My life has moved forward in a linear sense- I’m older, a working man, in a 5 year relationship, and like both Jed Clampett’s kinfolk and little Jimmy, we said “California is the place you ought to be” and loaded up the truck and all that. But 23 years later, I’m pretty fond of Jenny Lewis, I’m all into my Nintendo again, and still jazzed about playing Super Mario 3. Even if The Wizard is the longest and most well directed commercial ever, I’m glad it reminded me that as much as things change, they always stay the same. Next Post NEStalgia Week Pt.9; Congratulation! A Winner is You! After providing the link to the movie, you should have warned readers not to continue to the spoiler until AFTER they had viewed the movie. You may have been ruined the suspense for millions. Hmmm, I thought 20+ years cleared me of the spoiler alert statute of limitations. This is going to really throw a wrench into the works when I start recapping those old episodes of Columbo. Been catching up on your NEStalgia week posts, and they’re really good! (Got one more to go). Well done on not only writing in proper english, but on writing it with fluidity! Now, about this post. I had only ever heard of this movie in the last couple of years (I’m 29 now), and still wonder how I ever missed it! And not just me, but no one in my school ever mentioned it so I assumed our whole town did! Now, that town was in South Africa, so the country might have something to do with it, but shouldn’t have, as we got every other movie and tons of Nintendo games.. but yeah. Anyway, after hearing about it, I always planned to find a quiet time to get the movie somehow to watch it.. and you’ve just provided that, so thanks! Thanks for reading, glad you’ve been enjoying them! I snuck a look at The Wizard’s IMDB page, I don’t think it had a theatrical release in South Africa. In North America, it of course released before SMB 3 came out and served as the game’s unveiling, and successfully helped build the biggest buzz a video game had ever had to that point. But it had no real audience outside of people who played Nintendo games, and I don’t think it was very successful internationally, in all the places it came out SMB 3 had already been released, and the critics everywhere ripped it to shreds. Anyway, I still think it’s a pretty fun movie, and it definitely captures that era of video gaming well, the only film that I know of that does. I hope you like it.